Most people who've paid a few visits to Italian restaurants know caprese, a traditional Italian salad composed of just 5 ingredients: tomatoes, fresh mozzarella, basil, balsamic vinegar and olive oil. It is lovely, satisfying, complete, but as a history of restaurant-going has proved, caprese is not the surest item on the menu. It leaves nothing to be desired, when the fresh mozzarella is tender and high-quality, preferably mozzarella di bufala, tomatoes are vine-ripened, and balsamic vinegar is of the authentic artisanal kind. Unfortunately, grocery stores or grocery budgets seldom allow one to achieve perfection. My recipe is rather heavily modified to work even with the coarsest ingredients. Mix all dressing ingredients in a cup. The additions of vodka and plum vinegar make commercial grade balsamic more interesting. Slice lettuce and arrange on a platter. Finely chop 1/2 of the basil and sprinkle all of it over the lettuce. Massage 1/3 of the dressing into the lettuce leaves with basil. This forms the base salad, which is not needed in principle, but serves as an additional vehicle for the tasty dressing. Slice tomatoes into rounds and arrange over the lettuce. Roughly slice the rest of the basil and arrange over each tomato slice. Drip the second 1/3 of the dressing over the tomatoes. Next, mozzarella is to be flash fried. This step is intended to make the cheapest variety of fresh mozzarella - often tough and rubbery - delectable. Combine crumbs, salt and spices in a shallow dish. Slice fresh mozzarella into rounds, and dip both sides of each round into the spiced crumbs. Heat oil in a skillet until almost boiling. Quickly place mozzarella rounds into the oil, flipping almost immediately (in at most 20-30 sec), otherwise it will melt. 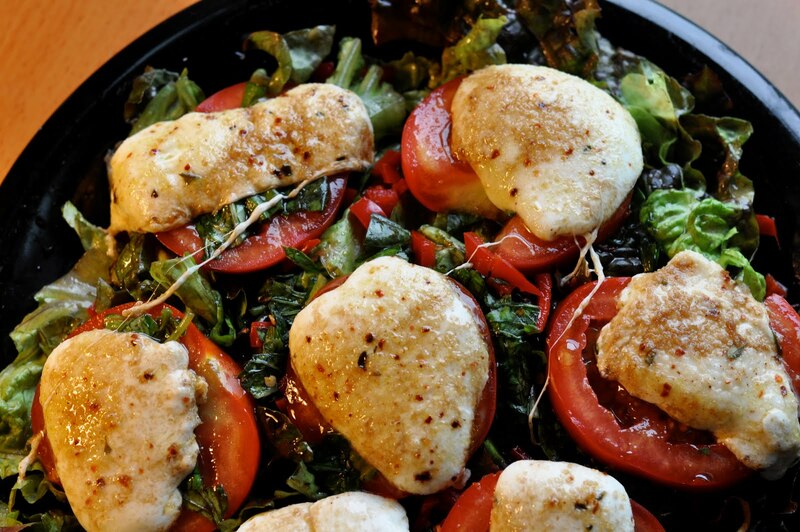 Let it fry for a few seconds and dish each mozzarella round out onto a tomato slice. Drip the remaining dressing over the half-melted half-fried cheese. Consume warm with relish.